Liczba stron: 387 Jest to ujednolicona liczba stron, która ułatwi Ci porównanie długości książek. Każda strona Legimi to 200 słów. 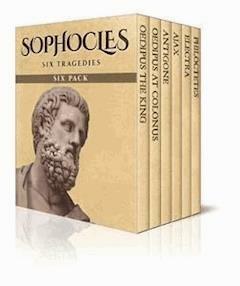 In Sophocles Six Pack you will find the Athenian tragedian's six masterworks - Oedipus the King, Oedipus at Colonus, Antigone, Ajax, Electra and Philoctetes. The digital edition of Sophocles Six Pack includes an image gallery. Oedipus the King; Oedipus at Colonus; Antigone by Sophocles - Translated by Francis Storr. First published in Sophocles; with an English translation in 1916. Ajax, Electra, Philoctetes by Sophocles – Translated by Lewis Campbell. First published in Sophocles, The Seven Plays in English Verse in 1883. Sophocles Six Pack - Oedipus the King, Oedipus at Colonus, Antigone, Ajax, Electra and Philoctetes by Sophocles. Translated by Francis Storr and Lewis Campbell. Published 2017 by Enhanced Media. All rights reserved. Is banishment—unscathed he shall depart. Should give the answer—who the murderer was. What sayest thou—"parents"? Who begat me, speak? Who murdered Laius—that man is here. That thou allegest—tell me what it is. 'Twere better sleeping ills to leave at rest. Thou comest—what thy need or what thy news.